Description This chapter describes the dermoscopyThe examination of [skin lesions] with a 'dermatoscope'. This traditionally consists of a magnifier (typically x10), a non-polarised light source, a transparent plate and a liquid medium between the instrument and the skin, and allows inspection of skin lesions unobstructed by skin surface reflections. Modern dermatoscopes dispense with the use of liquid medium and instead use polarised light to cancel out skin surface reflections. of Lentigo maligna and lentigo maligna melanomaThis glossary term has not yet been described..
4.2.2 Short and polygonal lines around and between adnexal openings. Lentigo maligna, LM, LMM, Lentigo maligna melanoma, Melanoma, Face, Sun damaged skin Lentigo Maligna – cite! Lentigo Maligna (message) Lentigo Maligna – participate! Lentigo maligna is a subtype of melanomaThis glossary term has not yet been described. that arises on sun-damaged skinThis glossary term has not yet been described.. The term lentigo maligna denotes melanoma in situnot seen to be spreading from a localized position, whereas lentigo maligna melanoma (LMMLentigo maligna melanoma) denotes invasive melanoma. We use LMM as a term that encompasses all melanomas (in situ and invasive) on sun-damaged skin. MelanomaThis glossary term has not yet been described. on sun damaged skinThis glossary term has not yet been described. (extrafacial) is covered in a separeate chapter LMMs occur most frequently in the elderly population. The common anatomic sites include the sun-damaged skin of the bald scalpThis glossary term has not yet been described. and faceis a central body region of sense and is also very central in the expression of emotion among humans and among numerous other species..
Clinical examinationThis glossary term has not yet been described. LMMs are patches to flat plaques, variegate in colorsThis glossary term has not yet been described. that range from light brown to black, and asymmetric in shape. These lesions tend to enlarge slowly and if left untreated, cover an area of several centimetres while remaining flat, at times appearing discontinuous and patchy on clinical examinationThis glossary term has not yet been described.. To appreciate the extent of the clinical lesion, Wood’s lamp is an essential part of the examination, and often, it reveals that the lesion is much more extensive than it appears on naked-eye examination. With time, LMM may develop invasive foci clinically evident as papules, nodules, or thicker plaques. LMM at that stage confers risk of metastatic disease. HistopathologyThis glossary term has not yet been described. Histopathologically, findings in LMM include an asymmetric lesion with an abnormal proliferation of single melanocytes in the basal layer of the epidermis, the melanocytes being unevenly spaced and increased in density (crowded), and often extend down follicles. Even few nests of melanocytes in a broad, junctional lesion on the face that displays solar elastosis in the dermis (evidence of sun damageThis glossary term has not yet been described.) strongly raise the suspicion of LMM. An irregular scatter of melanocytes in pagetoid fashion (at suprabasal layers of the epidermis) also supports the diagnosisis the identification of the nature and cause of a certain phenomenon. Diagnosis is used in many different disciplines with variations in the use of logic, analytics, and experience to determine "cause and effect". In systems engineering and computer science, it is typically used to determine the causes of symptoms, mitigations, and solutions of LMM. Nests and fascicles of melanocytes in the dermis attest that the melanoma is no longer in situ. LMM in the dermis may display at times desmoplastic and neurotropic features. Early LMM may be clinically subtle and difficultneeding much effort or skill to accomplish to diagnose on the sundamaged background that displays many solar lentiginesThis glossary term has not yet been described.. Other differential diagnoses include pigmented actinic keratosisActinic keratosis (also called solar keratosis and senile keratosis; abbreviated as AK) is a pre-cancerous patch of thick, scaly, or crusty skin., lichen plaunus-like keratosis, and early, flat seborrheic keratosisThis glossary term has not yet been described. or solar lentigoThis glossary term has not yet been described.. On the face, a pigment networkThis glossary term has not yet been described. is usually absent due to the flattening of the dermoepidermal junction (DEJ) and effacement of the rete ridgesEpidermal extensions that project into the underlying dermis. Thus, additional dermoscopic criteriameasure of how well one variable or set of variables predicts an outcome are applied to diagnose early LMM. Annular–granular pattern can be divided into dots aggregated around adnexal openings and short and polygonal lines around and between adnexal openings. 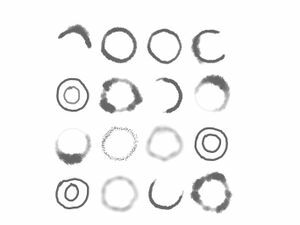 These two components of the annular–granular pattern can be seen singly or in combinationThis glossary term has not yet been described.. The findings range from brown dots to blue-gray granularityThis glossary term has not yet been described. scattered throughout the lesion, but often appearing to cluster around the adnexal openings (Fig. 8d.6). 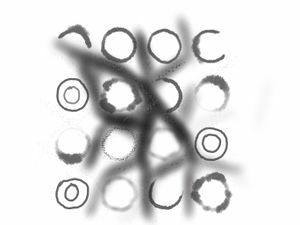 Based on dermoscopy to RCM and histopathology correlation, these findings are explained by aggregates of melanocytes and small nests at the DEJ between the follicles (brown dotsDots are small, round structures of less than 0.1 mm in diameter that have a red color when corresponding to blood vessels; however, when due to melanin, their color ranges from black, brown, to blue-gray depending on the depth and concentration of the melanin in the skin (Tyndall effect).) and by melanophages in the dermis (blue-gray granularity). Short and polygonal lines around and between adnexal openings. As the density of the brown dots increases, they coalesce to form short pigmented lines around the adnexal openings as well as between the adnexal openings. These lines are often polygonal, forming a zig-zag patternlines angulated or polygonal (non-facial skin). DermoscopyThe examination of [skin lesions] with a 'dermatoscope'. This traditionally consists of a magnifier (typically x10), a non-polarised light source, a transparent plate and a liquid medium between the instrument and the skin, and allows inspection of skin lesions unobstructed by skin surface reflections. Modern dermatoscopes dispense with the use of liquid medium and instead use polarised light to cancel out skin surface reflections. to RCM and histopathology correlation suggest that these structuresThis glossary term has not yet been described. are due to confluent junctional nests and aggregates of melanocytes by the annular–granular pattern, the concentric dermoscopic appearance has been termed isobar (also known as circle within a circlecircles concentric). Rhomboidal structures Elongation, thickening, and merging of the short polygonal lines around adnexal openings form a polyhedral-shaped structures that have been termed “rhomboidal” (in reality, the shapes vary but are all polygonal). The histopathologic correlation is similar to that of short and polygonal linesstreaksThis glossary term has not yet been described., albeit reflecting more extensive infiltration of the DEJ by confluent nests and aggregates of melanocytes. Dark blotches (also termed “homogenous structures”) with or without obliteration of the adnexal openings. Dark brown to black blotches are seen, initially with “sparing” of adnexal openings, appearing as light-colored holes within the blotchDark structureless areas , and eventually, as a homogenous black blotch with obliteration of the adnexal openings. It should be highlighted that the aforementioned melanoma-specific structures can be seen in lentigo maligna melanomas on the face and also in lentigo maligna melanomas arising on nonfacial chronic sun-damaged skin. This defines the observation on dermoscopic imagesA representation of a person, animal or thing, photographed, painted or otherwise made visible. of the presence of a colour, invisible to the naked eye, and darker than all clinically observable shades of brown or grey. 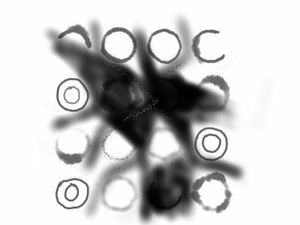 Target-like pattern We defined as ‘target-like pattern’ the presence of a dark dotSee [[Glossary:Dots|Dots]] in the centre of the dark circle of a hyperpigmented hair follicle. This dark dot was not a hairThis glossary term has not yet been described..
We defined as red rhomboidal structure a lozenge-shaped vascular pattern occurring in the area separating the hair follicles from the othersThis glossary term has not yet been described.This glossary term has not yet been described..
‘Increased density of the vascular network’ was defined as a vascular network of higher density within the lesion than in peripheral skin. 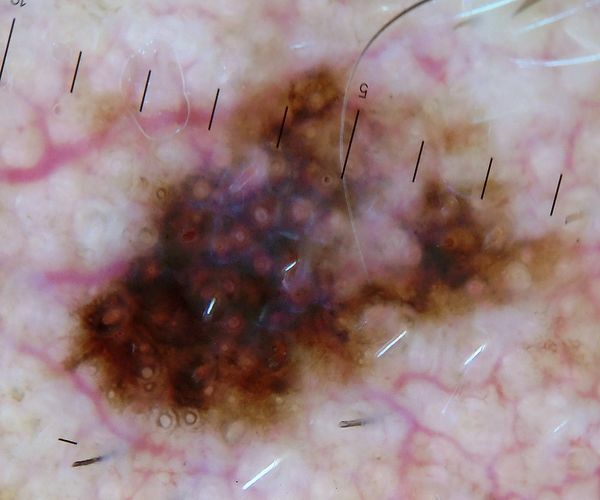 The first issue that needs to be addressed when evaluating a pigmented lesion on the face with dermoscopy is whether the lesion possesses any melanoma-specific structures. Although superficialThis glossary term has not yet been described. spreadingThis glossary term has not yet been described. melanoma is rare on the face, they can occur and thus all facial lesions need to be scrutinized for the presence of any melanoma-specific structures. If the lesion has any of the aforementioned structures then the lesion needs to be biopsied. If it does not have any of the above-mentioned melanoma-specific structures then the lesion is evaluated for the presence of features diagnostic of basal cell carcinomais the most common skin cancer, and one of the most common cancers in the United States. While BCC has a very low metastatic risk, this tumor can cause significant disfigurement by invading surrounding tissues, solar lentigo, or seborrheic keratosis. If the lesion has no features to assist in diagnosis then the lesion should either be biopsied or subjected to digital monitoring for at least 6 months to one year. ↑ Schiffner et al. : Improvement of early recognition of lentigo maligna using dermatoscopyThe examination of [skin lesions] with a 'dermatoscope'. This traditionally consists of a magnifier (typically x10), a non-polarised light source, a transparent plate and a liquid medium between the instrument and the skin, and allows inspection of skin lesions unobstructed by skin surface reflections. Modern dermatoscopes dispense with the use of liquid medium and instead use polarised light to cancel out skin surface reflections.. J. Am. Acad. Dermatol. 2000;42:25-32. PMID: 10607316. ↑ Pralong et al. : Dermoscopy of lentigo maligna melanoma: report of 125 cases. Br. J. Dermatol. 2012;167:280-7. PMID: 22404578. DOI. This page was last modified on 27 May 2018, at 22:05.